Toilet paper is one of those things we take for granted until it’s getting dangerously low or out of reach. 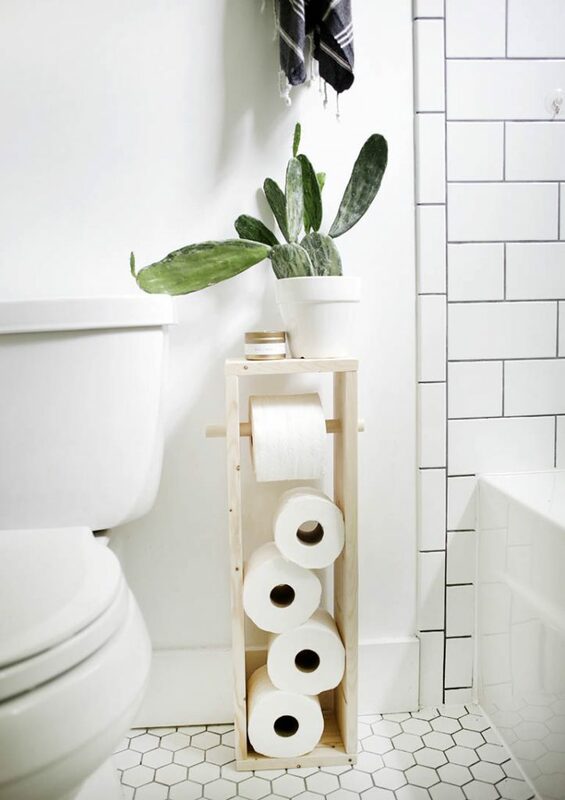 Sure, we could stack every single roll next to the toilet like a TP kingdom, but it isn’t exactly nice to look at. Maybe we just need update our distribution methods. 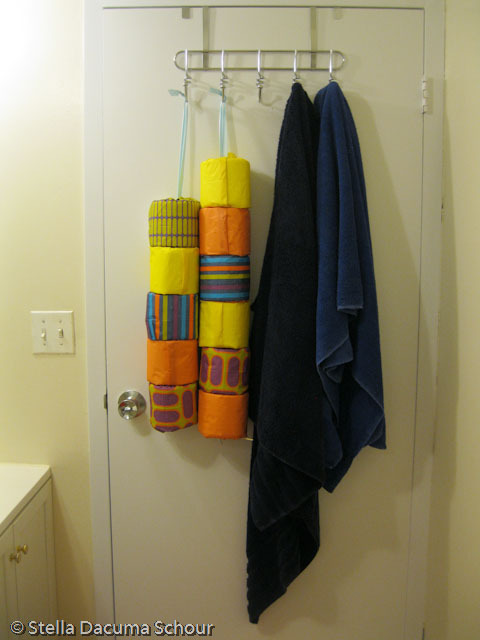 Last week we checked out some simple over-the-toilet storage ideas, this week we get a little more specific. We got everything here, from mass storage, to single roll holders, to some very strange/creative ideas. It should help get your inspiration rolling (yeah, I know, bad joke). You know what the true purpose of this shelf is? 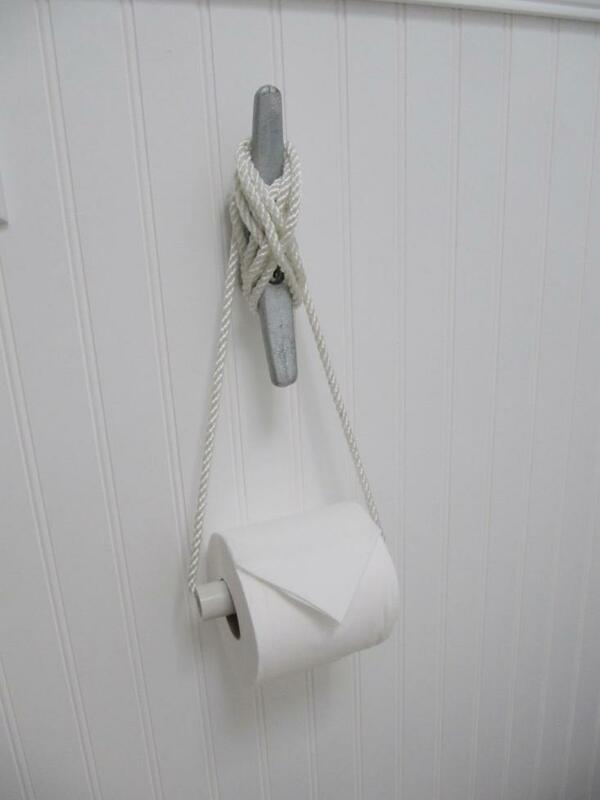 Somewhere to conveniently place your phone whole you pull off a few strands of toilet paper. Believe me, all your guests will appreciate it too. I can honestly say I would have never thought of something like this ever in my life. But now that I see it I can definitely see it being a part of my life. You see, I have a habit of just throwing the entire bag of toiler paper in my bathroom without a second thought. But cleverly hiding it in a burlap treasure chest? Amazing. Gotta love some beautiful simplicity, but the real beauty is in the details. The more you look the more you notice the care that went into the selection of materials used. 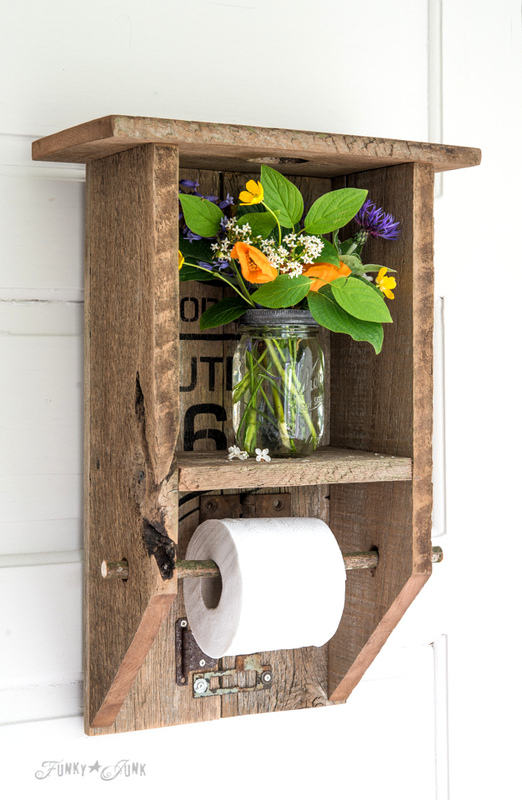 We certainly love rustic decor around here, and this is on the top of the rustic chart. 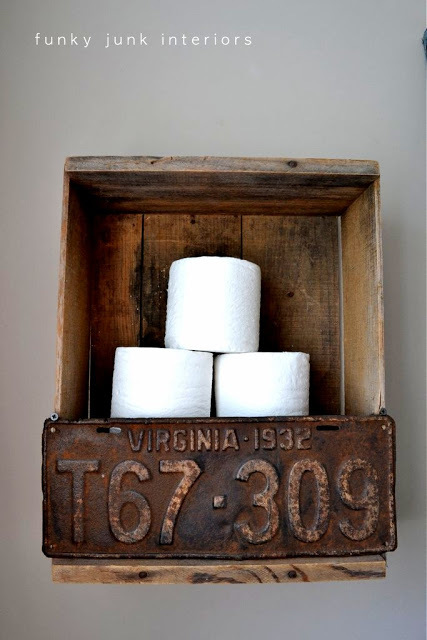 The reclaimed wood, the rusted old license plate… I think I’m in love. 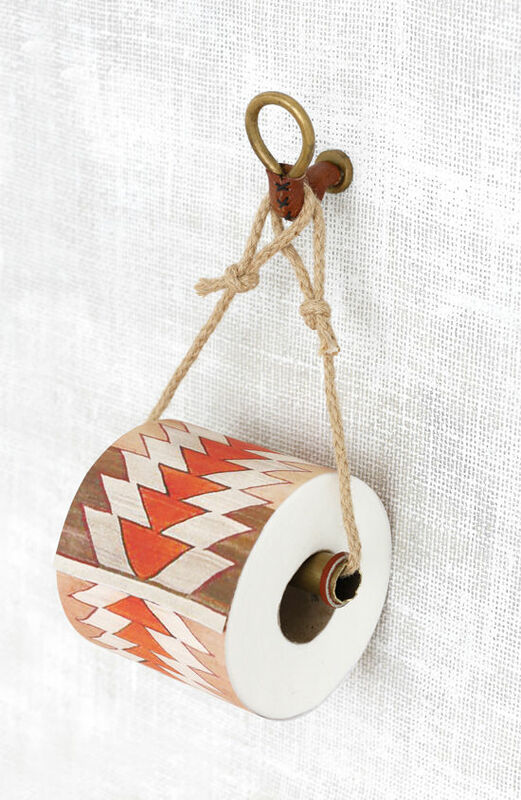 If you ever wanted a toilet paper holder that says “I’m just pooping while on my private yacht”, this will definitely give you some out-at-sea vibes. It’s simple but the nautical cleat gives it an interesting feel. 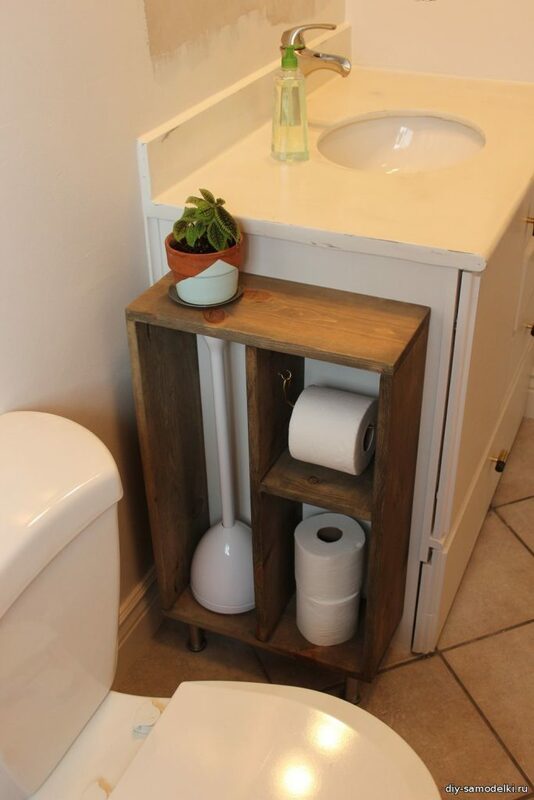 FunkyJunk is at it again with this reclaimed shelf that is beyond gorgeous. I was already loving item #4 with the old license, but I think I love this one just a little more. Look in behind the roll and you’ll find an stenciled Route 66 sign. Look closely. Yep, those are toilet paper rolls wrapped like it’s Christmas morning. This might be a bit strange but hear me out. This is perfect if you own an AirBnB. It’s presentable, convenient, and let’s everyone know you covered all the minor details. So these instructions are all in Russian, but I think we can properly translate through just the pictures. 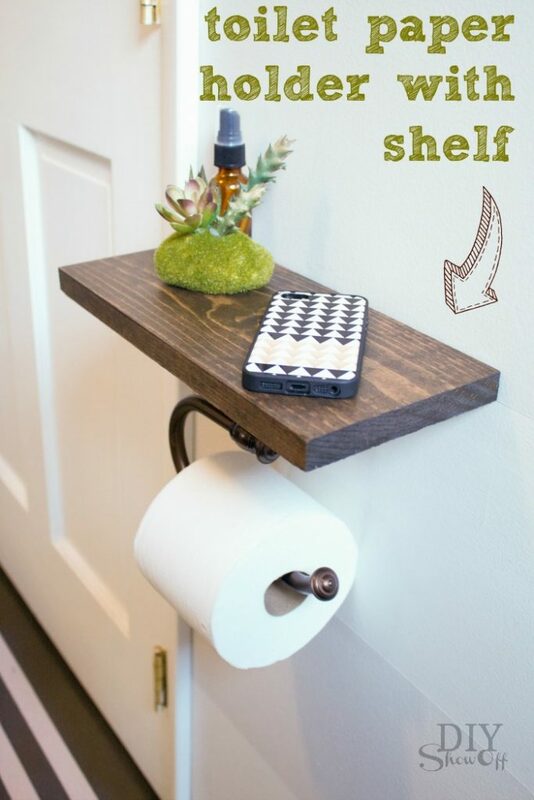 Construct the shelf using 8×1, add Capita legs from ikea, and stain using a dark walnut color. 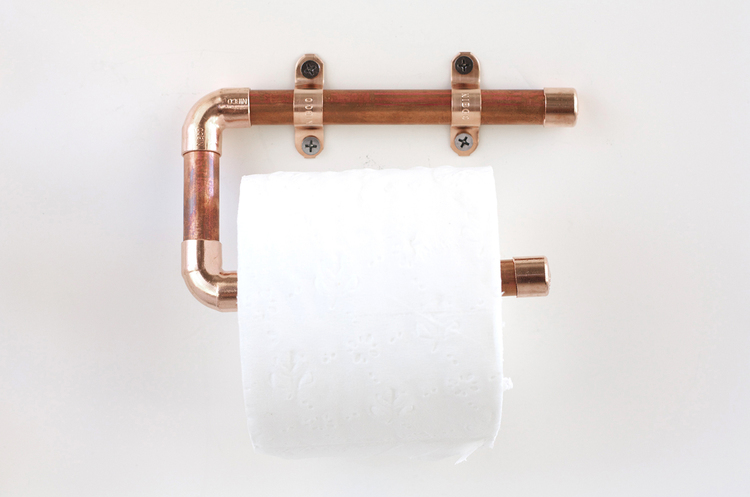 Discover your inner plumber with a copper holder. It’s certainly unique and has an unmistakable industrial charm to it. And it’s very cheap and easy to make. This one won’t be up everyone’s alley, but if you’re building a man cave or you’re very Canadian then you might appreciate this. One detail you might have missed: the stopper holding up the TP rolls is actually a hockey puck. Working in a small space? Maybe the solution is work IN the walls. 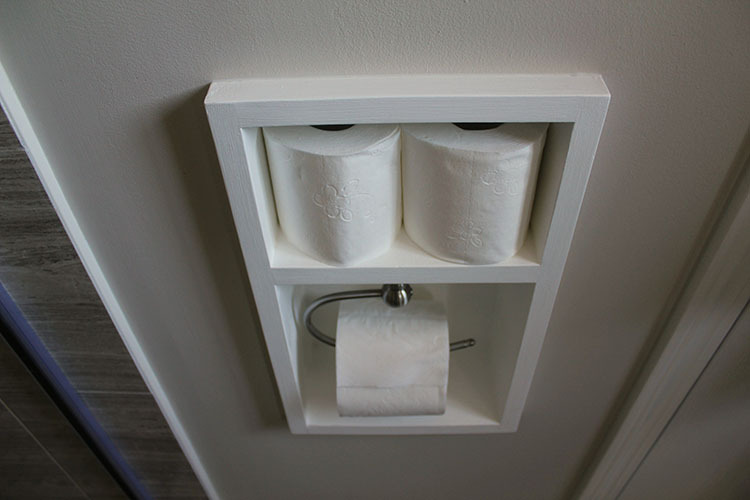 A recessed toilet paper holder looks neat and tidy, and a perfect space for your toiletry needs. 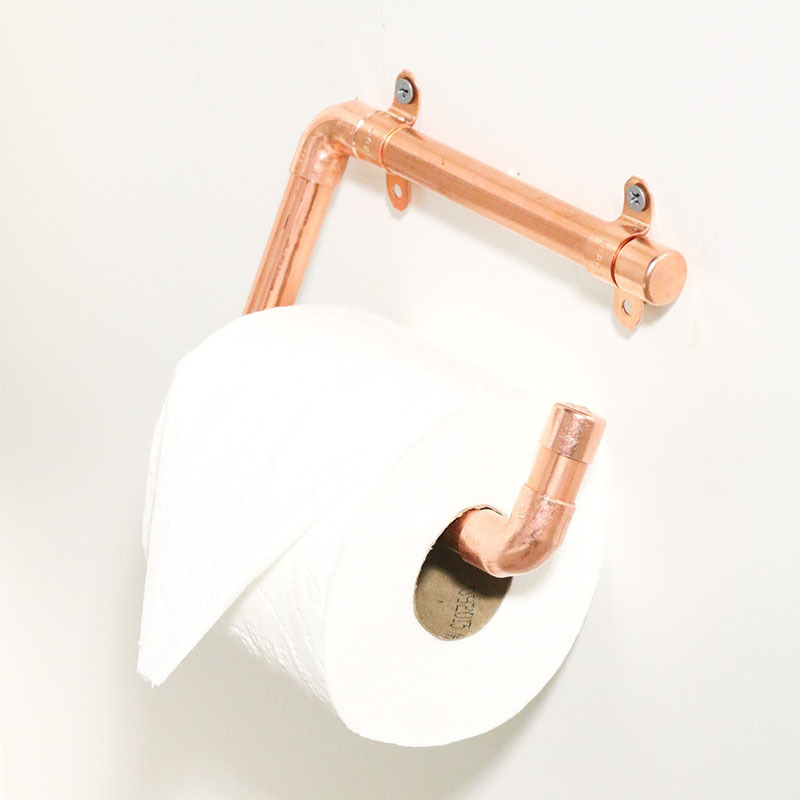 Another copper toilet paper holder? Well, like I always say: it’s good to see how two different people do the same project. You’ll get new ideas and better techniques that way. 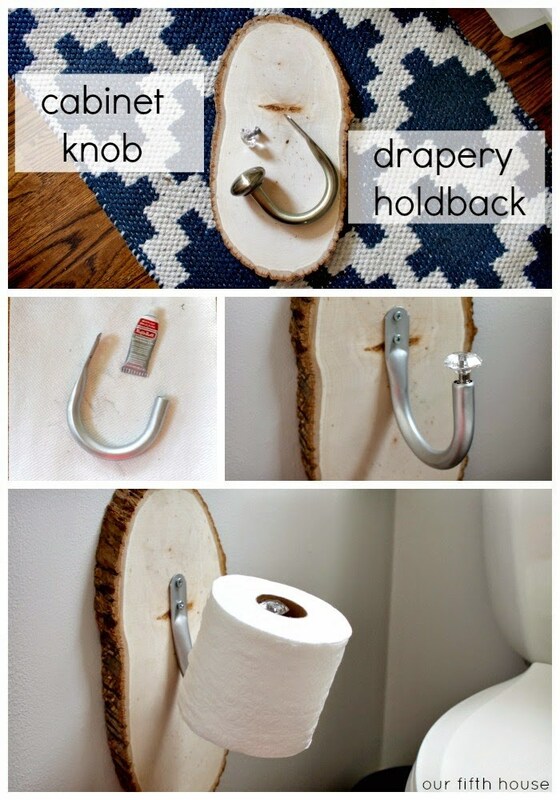 This is… a drapery hook on a log. 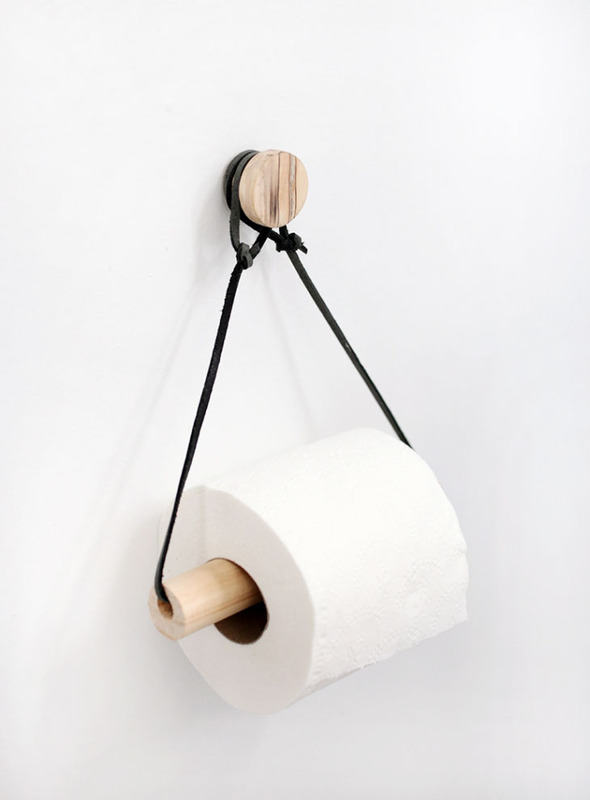 It certainly is not your typical holder, and the more I think about it the more this would be perfectly appropriate for a cabin bathroom. Another holder on a rope, but this time it takes a minimalist approach. Again, the finer details is what makes minimalist decor so appealing. The choice of string, the wood notch on top, it all comes together nicely. Well, this is as industrial as you can get. And just like putting together adult Lego, this fits together very easily and takes almost not time at all. 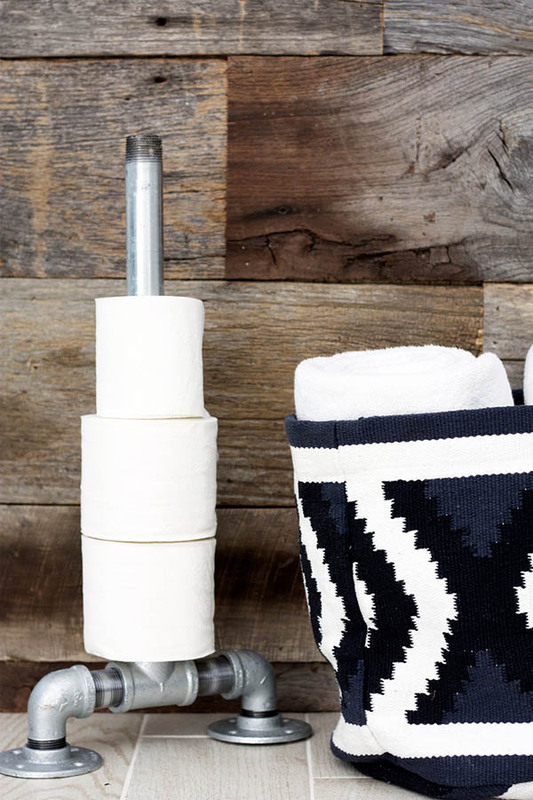 In stark contrast to our industrial holders, we have this homey basket tray that is perfect for our everyday bathroom needs. 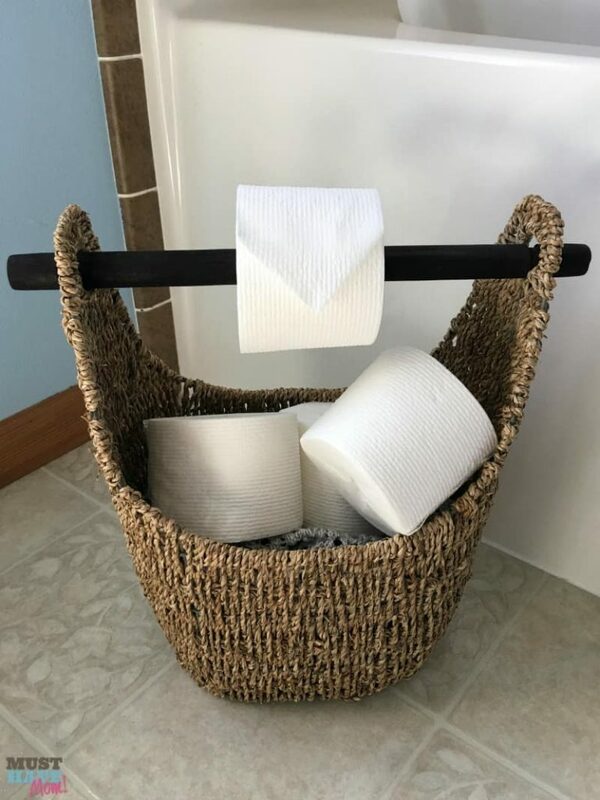 Again, super easy to make, because most baskets have handles that you can push a stick through to hold your TP. 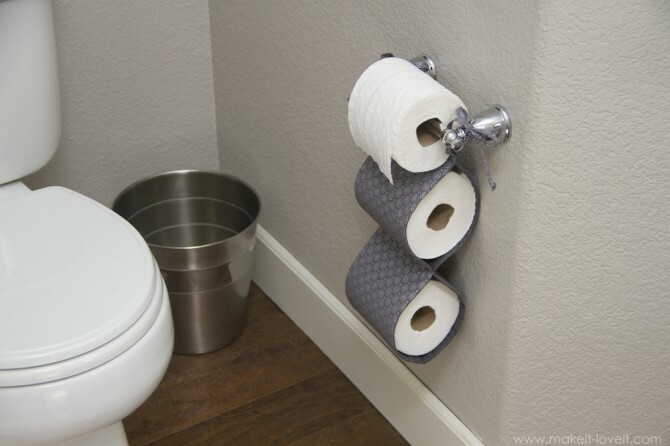 A triple decker TP holder made of fabric, an elegant way to provide multiple rolls. This is another instance that would be perfect for those hosting an AirBnB or multiple guests. That’s right, a dinosaur. Because why not? There’s no way an adult came up with this one. 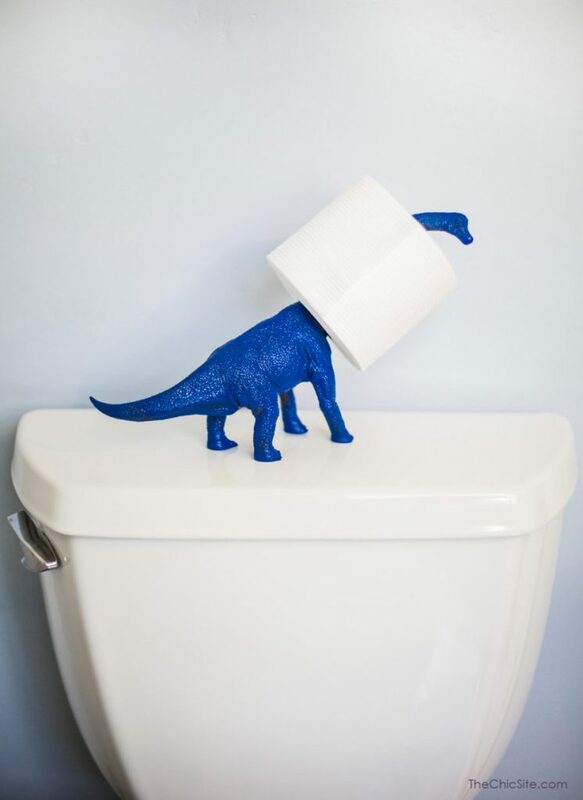 It’s way more likely a 10 year old jammed a toilet paper roll on his Brachiosaurus and the adults just let it roll. 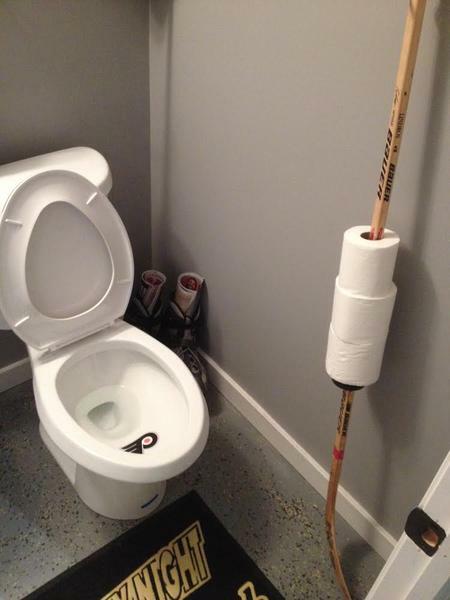 You can never have too much TP jammed into one place, and this one embraces that fact. 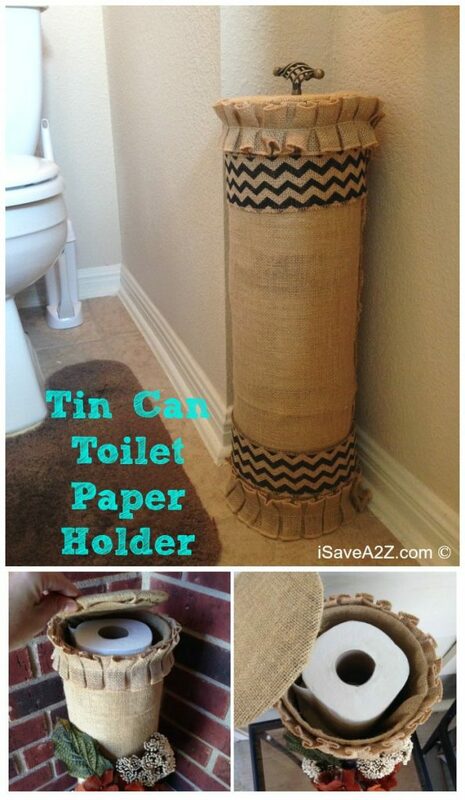 A tower of TP as your disposal, and enough room to show off your bathroom decor on top.